There's new hope for the galaxy! Framed special edition film cell from the Star Wars: Episode IV - A New Hope movie. Features 10 clips of real film, a poster image, a name plaque, and a certificate of authenticity! Measures 13-inches tall x 11-inches wide. 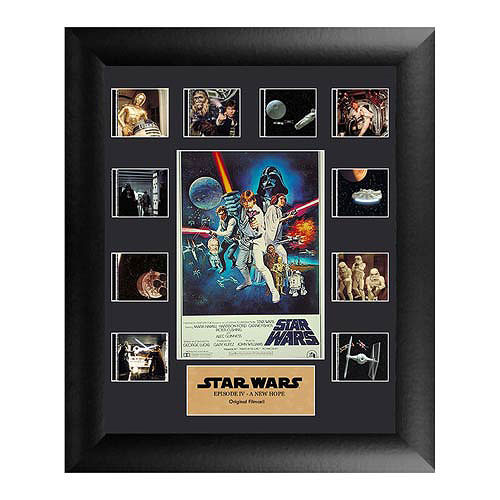 This Star Wars A New Hope Series 1 Mini Montage Film Cell is a special edition that contains 10 clips of real film from the Star Wars: Episode IV - A New Hope movie, a beautiful poster image, and a special edition name plaque. These elements are double matted and placed within a beautiful black frame that measures 13-inches tall x 11-inches wide and comes with a Trend Setters embossed/foiled certificate of authenticity. Made in the USA. Ages 14 and up! Part IV in the George Lucas epic, Star Wars: A New Hope, opens with a Rebel ship being boarded by the tyrannical Darth Vader. The plot then follows the life of a simple farm boy, Luke Skywalker, as he and his newly met allies Han Solo, Chewbacca, Ben Kenobi, C-3PO, and R2-D2 attempt to rescue Rebel leader Princess Leia from the clutches of the Empire. The conclusion has the Rebels, including Skywalker and flying ace Wedge Antilles, attacking on the Empire's most powerful and ominous weapon, the Death Star.